Serves 4 . Preparation time 10 minutes. Cooking time 25 minutes. • Rub the masala and oil into the chicken breasts. Make a dressing by mixing the chutney, coriander, lime zest and juice with the coconut milk in a jug. • Braai the chicken over hot coals undisturbed for 7 minutes skin-side down to brown it nicely. Turn the breasts and move to a cooler spot. Braai for 10 minutes, turn and braai for another 5 minutes or until cooked through. • Remove the chicken from the braai and put it on a platter. Drizzle with a few tablespoons of dressing and rest under a piece of foil before slicing. • Make a salad by cutting the cucumber into ribbons using a potato peeler. Arrange the cucumber, salad leaves and onion on a platter. 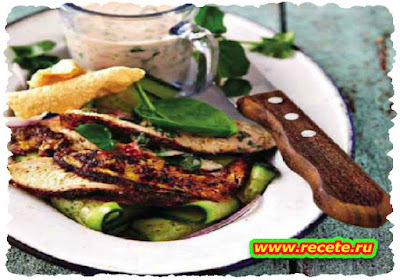 • Serve slices of chicken with the salad and the rest of the dressing. You can also quickly fry (or microwave) some poppadoms and serve on top of the salad.